Hello and welcome to the Island Eagle home page. 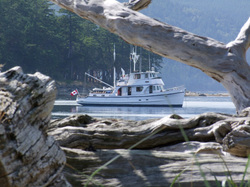 Island Eagle is 61 foot trawler designed by Arthur DeFever, built in San Diego and launched in 1964. By the way, you can click on most of the images for a high-res version. I've been neglecting the site as I've been working on my new startup, Edsby (www.edsby.com), but I'll try and whip it into shape in the next few weeks.